Social justice activist and film director from Gambia, Ibrahim Ceesay is fighting against climate change with youth for many year. Interview. Ibrahim Ceesay is a social justice activist and a film director from Gambia. Climate Change is not a new issue for him. He used to participate to all conferences related to Climate Change and development. He is now based in Ethiopia for political reasons. 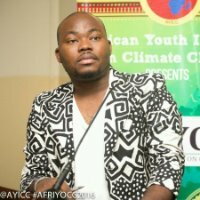 In 2015, during the 5th Climate Change conference and development in Africa, he explained his vision on how to promote the activities of youth in Africa. He also gave his view on how the diaspora can have an impact in the development of the continent. Yesterday, he took part of the presentation of the nigerian lawyer Nkiruka Nnaemego book on sustainable agriculture projects for youth in the continent. He prefaced the book as the coordinator of his new organization, the Comprehensive Africa Agricultural Development Program (CAADP). “Youth are great assets in agricultural revolution across Africa.” “It is imperative for Africa and her partners to deepen their support for African youth in order to encourage them to get actively involved in sustainable agriculture,” he emphasized in the preface.